The Empress is the third card of the Major Arcana. The Empress is traditionally connected to Venus, whose astrological symbol can be seen on her heart-shaped shield. She’s crowned with stars and holds a specter, signifying her royalty and power. Around her is a lush field of grains ready to be harvested. The field of grains, and the water that flows beside her, symbolize abundance and fertility. She often appears in tarot decks as pregnant. She represents the traditional archetype of Mother. The Empress signifies motherhood, creativity, beauty, sensuality, and abundance. The Empress card is often connected with motherhood and pregnancy. Of course, this doesn’t have to mean literal pregnancy. This card can show up when you have an idea or project that is ready to be birthed. The Empress rules over creative abundance. It’s a call that whatever gift you have to share with the world needs to be made tangible. Whatever it is, work hard to get it out there. It’s ready to be born! The Empress also indicates a need to be nurturing. This applies to both female and male querrents. What or who in your life needs extra attention and support? The Empress lounges in comfort and confidence on her throne. As long as you are taking care of yourself emotionally, you are in a good place to extend support to others. Conversely, depending on your reading, the Empress card might apply to a need to nurture yourself. Are you engaging in healthy self-care? Take a break if you need to. If you’re feeling depleted, be sure to make time for some pampering. The Empress gives you permission to splurge on yourself with your favorite rejuvenating activities: get a massage, have a spa day, or book a Reiki session! There’s are plenty of inexpensive activities that are soothing, so money shouldn’t be an issue. Taking a cue from the Empress’s beautiful surroundings, take a walk outdoors. The Japanese concept of forest bathing, or the healing properties of being present in nature, is especially applicable to the Empress card. The Empress can be a call to appreciate the abundance and comfort you already have. It’s normal to get caught up with comparing yourself to others. This is particularly true in the digital age where we only see a heavily curated slice of someone’s life. Take a step back and realize that you possess abundance that some only dream of. Tidy up and beautify your surroundings. Carve out a little area of your home to keep as your own comfy, sacred space. Retreat to it when you need a break. Surround yourself with art and objects that bring you comfort and joy. The Empress represents a nurturing and caring partner or friend. It’s a great card to represent long-term partnerships. When the Empress appears in a reading regarding relationship conflicts, it’s a message to approach the conflict with an open heart. Make sure that you are giving the other person the benefit of the doubt. Be aware of how hurt feelings may be at play in the situation. Bruised egos may need soothing. Take a more compassionate approach to reconciliation. The Empress represents the potential for a financially and emotionally rewarding career. If you’re examining the outcome of a specific project, the Empress is a great outcome card. She’s traditionally an indicator of material wealth and abundance. The Empress can represent roles that involve facilitating ideas or people. These can be managers, Human Resource professionals, counselors, and CEOs of ‘heart-centered’ businesses. Of course, with the connection to creativity, it’s a natural pairing with artists, actors, writers, filmmakers, musicians, and other creatives. The Empress personality is nurturing, confident, and creative. They can be incredibly soft-hearted. 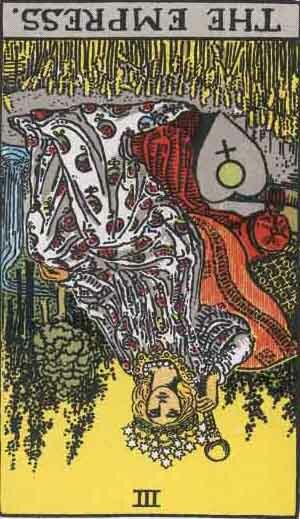 Although it has a strong connection to women and motherhood, this card can appear as a male figure as well. Individuals represented by the Empress card are strong and caring. They make wonderful leaders, as they’re able to balance getting results while still looking out for their people. The Empress reversed can represent detachment from important emotional elements in your life. Try to take a more engaged and nurturing approach to cultivating your relationships. Sometimes people and projects need a little bit of hand-holding to come to fruition. If that sounds like a lot of effort to you, consider it a temporary situation until the project gets born into the world. The Empress can also signal a disconnect from your creative self. This can be a call for you to get back in touch with your creativity. Schedule time for journaling, visiting museums, and being in nature. Because of The Empress’s connection with material abundance, consider indulging yourself a little! It doesn’t have to be extravagant, or even monetary for that matter. It can be a small commitment to carving out space and time for yourself to engage in healthy self-soothing. Sometimes, the Empress reversed can show up when your emotional reserves have been tapped out. This could be from a lack of self-care or from draining relationships. If it’s from self-care issues, you’ll need to take some time to yourself. Set up boundaries so you’re able to be emotionally available for the key people in your life. If the Empress is showing up in reverse for you due to draining relationships, then take a step back and evaluate the nature of these relationships. Are you or a close companion going through a difficult time? Or are there toxic elements to some of your relationships? Try to pinpoint where exactly you’re being drained. It’s worth mentioning that the Empress card reversed can also be its upright properties taken to the extreme. This often takes the form of smothering and controlling behaviors. Make sure that you aren’t holding the reigns so tight that things don’t have a chance to grow. The Empress in reversed can signal delays in your plans for romance and family. If this is the case in your reading, it’s worth pulling another clarifying card to determine whether this is from a specific issue or if it’s simply because the timing isn’t right. The Empress reversed can represent an individual who is cold and emotionally disconnected. This could be a temporary state if the person in question is in the midst of a difficult situation. Occasionally this card in reverse can signal toxic behaviors and interference from female (usually) family members. Case in point: the proverbial meddling mother-in-law who is simultaneously smothering and cold. The Empress reversed can indicate work that’s sterile and impersonal. It can be the sign of a job that’s emotionally unfulfilling. An example of this would be a large corporation with strict rules that do not take into account the human element of a workplace. Sometimes these types of jobs are unavoidable. If you aren’t able to leave this situation, then it’s imperative that you take good care of yourself after work. Find outlets that allow you to be creative and connected to others. Even better if these outside hobbies foster relaxation, better health, and confidence. This card can also signal a dead-end on a project. Despite effort a project is stalling out. If that’s the case, this can be overcome by taking a step back and giving it some breathing room. Try to take a more relaxed approach, rather than forcing things. The Empress reversed can represent two ends of a spectrum: smothering attention or detached coldness. This card can represent individuals who don’t currently have the emotional reserves to engage in mutually supportive relationships. If there is attention, it can be intense and constricting, particularly if related to mothering. In traditional tarot reading, the Empress reversed can represent sickness or conflicts with mothers. If this card comes up in this context, examine how past relationships with maternal figures in your life are affecting you now. If they’ve been negative, this is a call to start exploring shadow or inner child work to resolve those inner conflicts. The Everyday Witch Tarot features a very visibly pregnant Empress card. She’s surrounded by apple trees representing fruitfulness and abundance. The traditional symbols of the Empress card can be seen in her robes, scepter, and crown. The black cat is a reoccurring character throughout the Everyday Witch tarot. The dog is both a faithful companion and a protector figure. I love the simplicity of the Mesquite Tarot’s Empress card. The symbol that’s used to indicate both Venus and females is used in place of a figure. There’s still a hint of the Empress’s royal nature in the minimalist crown of stars above her head. Below the symbol are what appear to be wild roses representing passion and sensuality. The Wild Unknown uses a beautifully colored tree as its representation of the Empress. The symbolism of a tree speaks to the Empress as a fruitful and protective figure. Above the tree is a crescent moon symbolizing cycles, feminine energy, and intuition. The Empress card doesn’t always have to be a blonde woman lounging in her robes. The Mystic Mondays card depicts a lounging figure covered only by two pink palm leaves. She’s completely comfortable with herself in this bountiful tropical paradise. The pomegranate and bananas she carries are nourishing —and a bit suggestive too! Her blue hair flows into the water below her and she’s cloaked with lush green earth. This points to her as a representation of Mother Earth. Behind her is a sun representing her emotional warmth. The Fountain Tarot is one of my favorite decks. I love its modern depiction of the tarot’s archetypal figures. For the Empress, a woman stands in water filled with lilies and plant life. She wears a beautifully patterned robe that indicates her status and sense of creativity. She’s surrounded by green and blues representing both fertile abundance and her calm nature.